Eat What You Love, Love What You Eat: How to Break Your Eat-Repent-Repeat Cycle is written by Dr. Michelle May, a recovered yo-yo dieter with a background in both medicine and psychology. After twenty years of yo-yo dieting, May finally developed a healthy and balanced relationship with food and aims to help others to break out of the cycle of chronic dieting and overeating. Although May encourages enjoyment of food and eating the foods that you like, this does not mean that you can continue with unhealthy habits and expect to lose weight. Instead she helps dieters to tune into the natural cues from the body to rediscover when, what, and how much to eat without the need to follow a restrictive plan. She promises dieters that they can learn to eat the foods they love in appropriate portions without feeling restricted or experiencing fear and guilt. This is not a standard diet in the traditional sense, but rather a program that will help you to improve your eating behaviors and your relationship with food. Ultimately this will assist you to manage your weight without the need for stringent dietary guidelines or grueling exercise regimes. The foundation of The Eat What You Love approach is balance, variety and moderation. May advises dieters to select and eat foods with awareness and purpose rather than simply eating mindlessly or in response to stress. She says that we should eat with the intention of feeling better when the meal is finished than we did before eating. Dieters are encouraged to look at the reasons they eat such as stress, boredom, anxiety, depression, time of the day or social situations. Then May provides tools that will help dieters to identify true hunger and the internal cues that signify fullness and satisfaction. Eat What You Love also places a strong emphasis on the development of patterns of positive thinking and provides practical advice on goal setting and always challenging yourself to improve. 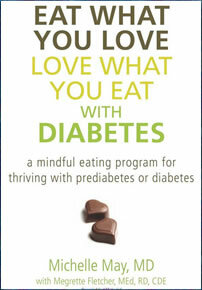 Eat What You Love, Love What You Eat with Diabetes is based on the principles in May’s first book. It is designed to help diabetics reduce their anxiety about eating by learning what are the most appropriate foods for their body. The book is divided into six parts, which each introduce a key mindfulness skill: Awareness, Curiosity, Nonjudgment, Being Present, Letting Go and Acceptance. When you put these skills into practice you will experience changes in how you think about your diet and lifestyle. You are encouraged to think about why, when, what and how you eat. The emphasis is on learning to nourish your body and enjoy your meals. It should not be necessary to follow strict regimes or excessively restrict food choices in order to stay healthy. Diabetic readers are advised to plan their meals based on the guidelines of USDA’s “My Plate”. The basic structure has been adjusted to make it more helpful for people with diabetes. At each meal you should fill half of your plate with low carbohydrate vegetables. A quarter of the plate should be protein and the remaining quarter, grains or starchy vegetables. You also have the option to add a portion of fruit and dairy to the meal or alternatively save these items for a snack for later. It is important for diabetics to be aware of the amount of carbohydrates consumed in a meal. You will learn how different foods impact your blood sugar levels so you can modify and adjust your diet accordingly. Fruits, vegetables, whole grains, beans, nuts, low fat dairy products, fish, lean meats, avocado, olive oil, chocolate. There is no meal plan included in Eat What You Love as May encourages dieters to develop their own personal eating style. Exercise is an important part of this plan but dieters are warned to avoid thinking of exercise as punishment for overeating. May says that our attitude to exercise should be “Do what you love and love what you do”. She encourages dieters to regard exercise as a vital component of a healthy lifestyle and emphasizes the health benefits of exercise such as stress relief, cardiovascular health and prevention of osteoporosis. Included in Eat What You Love are diagrams and recommendations for strength training and stretching exercises. 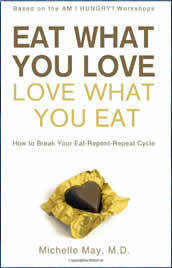 Eat What You Love, Love What You Eat: How to Break Your Eat-Repent-Repeat Cycle retails at $24.95. Eat What You Love, Love What You Eat Diabetes retails for $17.95. Click here to purchase either book for a discounted price. Will help dieters to break the cycle of yo-yo dieting. Addresses the emotional and psychological aspects of dieting and weight management. Encourages exercise as a component of a healthy lifestyle. Does not require elimination of favorite foods. Teaches dieters to identify true hunger and satisfaction. May not apply to dieters who feel their weight gain has a physiological cause. Will probably not produce fast results. Eat What You Love, Love What You Eat provides dieters with practical tools that will help to break the cycle of dieting and compulsive overeating. By following the strategies outlined in this book dieters will learn to create a positive relationship with food and to develop their own flexible diet and fitness plan that will be the foundation of a healthy lifestyle approach to weight management.